Owing your own business offers you amazing benefits as it gives you the chance to be your own boss, to work with amazing people and most importantly it gives you the way of working on your passion and turning it into success. But in the competitive market, it becomes challenging for every businessman to run their business successfully. Although a good and talented project manager plays a crucial role in defining business success that is all not enough. To make your business successful it is essential to make careful planning, paying attention to minor details and to develop effective communication. Make a Team of Smart People: The long term business success is highly dependent on the right team and talent. The team is the company's backbone and therefore it is important to implement the right hiring strategies. To define your business success it is crucial that every member of your team is committed to their work and share a similar vision towards achieving the goal. If your business in on the startup phase then it becomes essential for you and your team to work long hours initially and to face many ups and downs. It helps you in accomplishing your goals and enjoying business success together. Use Right Tool: To make your team work efficiently, it is good to look for the tool like jiPanel. It not only allows you to manage your tasks efficiently but also avails you project management tools like prioritizing a task, running timer on every task etc. This makes your team to do sufficient tasks in a day and also helps you to track the performance of employees and to justify project status as well. Think Innovatively: Who doesn't want to make their business successful? But even after so many efforts why not all among the list are able to do so? The answer is failing in doing right planning and implementing innovative ideas. Therefore the foremost task one should do for defining business success is to think of the ways and ideas that set you apart from your competitors. Using new technology and clever marketing is not enough and helpful in reaching your goals. It is important to offer real value and new experience in implementing your business strategies. Smart planning generation and paying attention to the latest trends is the foundation of a successful business. Planning helps the team to stay organized and meeting deadlines. Also, the right focus keeps stakeholders aware of the business progress, thus increasing the credibility of your business. Build Large Network: Although you are confident enough about your business strategies there is no harm in listening to outside sources. Open communication within the team and sharing of updated information among the team members is essential and is vital for the success of a project. Good communication helps in knowing the areas where the current project is not enough to meet the required goals, thus it is highly beneficial in giving convenient access and in improving business policies. It is also important to communicate thoroughly and never commit things that your project team can't deliver. Saying no at the right time can save you and your team from facing unnecessary problems later on. Thus taking out time to communicate and to build a network helps you in focusing and in knowing people that may help you in the future. A big network makes ways of getting valuable advice that ultimately helps you in expanding your business perspective. Consider The Risk Involved: Although project manager pays proper attention towards the right implementation of the project, every plan has certain risks associated with it. It is therefore good for a project manager to create a risk log that may arise while working on the project. Make sure that the whole team is well aware of those risks and can think of the ways of quickly resolving the issue. This keeps your team confident enough and helps your clients in feeling comfortable and secure. Make A Strong Project Closure: A strong project closure defines your team progress and ultimately your business success. The project team should be confident enough while answering the customer and makes sure that all of their success factors have been met successfully. You can also ask the customers to fill a satisfaction survey. It helps your team in gaining valuable information that one can use in the future. Thus project manager with the whole team makes sure that everything runs smoothly and guarantees project success. This success will influence the team and encourages them to deliver quality projects in the future. You establish your business to meet customers' need and to make sales by fulfilling their demands. A successful entrepreneur visualizes every problem as a challenge and opportunity to grow. 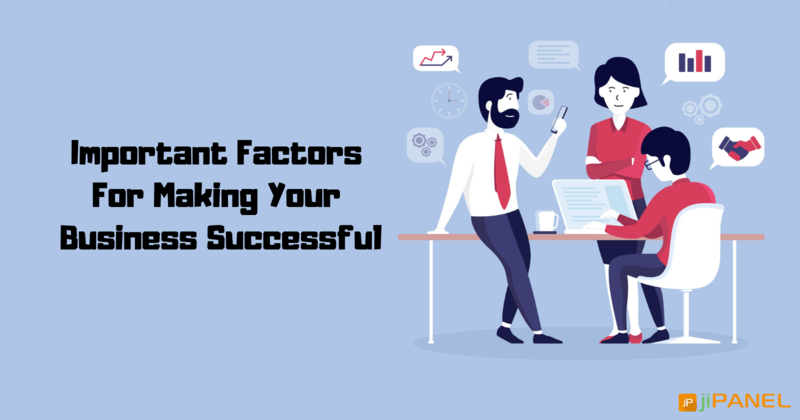 It is therefore very important to look for the ways of how to meet all the essential factors required for defining business success. You can look for tools like jiPanel, a simple project management system. The system helps you in seeing all the information at glance, accessing task anywhere and anytime, and help in simplifying your planning process.